It’s the biggest day of your life and Chris Priest can add that extra ‘touch of magic’. 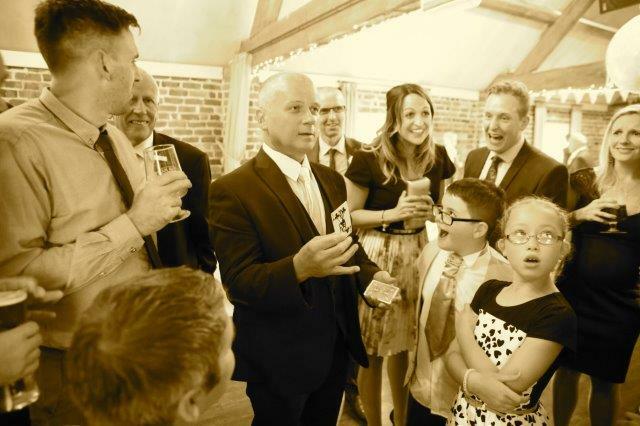 Close-up magic is ideally suited to any wedding celebration as Chris is able to mingle with guests and perform illusions right under their noses. Before they know it they become part of the show as the magic happens before their very eyes, sometimes with their possessions and often in their hands. Quotes from Clients and Organizations. Dear Chris, It doesn’t seem possible it is now three weeks since the big day! A sincere thank you on behalf of Glenis, Alex, Rob & I for your excellent performance at the reception. We thoroughly enjoyed hearing the shrieks of laughter and applause from each of the tables as you did the rounds. There have been many, many favourable comments and your presence helped the day towards being the outstanding success we all remember. We all wish you the very best for the future and of course we shall recommend you whenever the opportunity arises. Yours, with much appreciation.